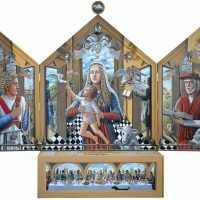 A new altarpiece by renowned Gloucestershire artist PJ Crook was unveiled at St Michael and All Angels Church, Bishop’s Cleeve on 13 December. 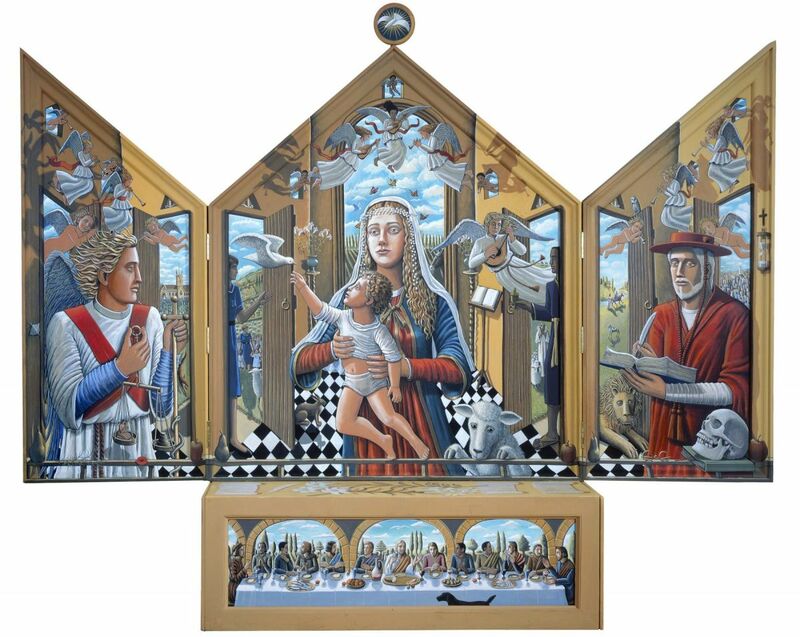 The artwork will be dedicated by the Bishop of Gloucester, the Rt Revd Rachel Treweek. It shows the image of Mary and baby Jesus, the mother and child, a subject that PJ chose because it was close to her heart and something that she had personally experienced, as well as being a universal and iconic image. It is the second time that PJ has gifted artwork to the church and this piece will complement the crucifixion painting, known as the Rood, that she made and donated in 1986. In the image, the young Mary gazes into the future. Around her head is a circle of butterflies, symbol of Resurrection, whilst the caterpillar makes its way along the rail at the bottom. The infant Christ reaches up towards the Dove, symbol of the Holy Spirit and more latterly of peace. Local people might recognise former school nurse Margaret Whitehead who was killed in a car accident. She appears in the central panel and represents the annunciation, the moment when Mary was told that she was to be the mother of Jesus. It is also possible to spot St Michael’s Church in the left panel. PJ has lived in Cheltenham her whole life and has close connections to the church.